Consumer Behavior Theory: These theories consider a range of factors that influence the choices of the consumers. Intrinsic Properties: These are the internal properties of the object. Neoclassical Microeconomics: This is the branch of economics that examines consumer utility. Economic theories on consumer behavior have always fascinated microeconomists and policy makers. Understanding the way consumers behave is a challenging task as each consumer has unique characteristics and they respond differently to different situations (Bovi 2009). Economists have used different approaches to explain consumer behavior. The main aim of Samuelson’s (1938) study was to examine utility as a psychological construct, while analyzing issues related to the marginal rate of substitution and how consumers behave to with changes in price. Samuelson (1938) extended Georgescu-Roegen’s (1936) study of the pure theory of consumer behavior. Later, the works of Samuelson (1938), Debreu (1959, 1960), and Morishima (1959) were extended by Lancaster (1966). There are three ways in which the new approach to consumer theory is different from the traditional theory of consumer behavior. Firstly, goods do not provide direct utility to the consumers. It is the characteristic that the good possesses that provides direct utility to the consumers. Secondly, one good has many characteristics and different goods may have similar characteristics. Thirdly, composite goods may have different characteristics than individual goods. The main aim of this paper is to review the seminal works of Paul Samuelson and Kelvin Lancaster in the field of consumer behavior. Both of their studies on the theory of consumer behavior are still very much alive in the academic literature. This paper is divided as follows. Section on “Literature Review Related to Samuelson’s and Lancaster’s Work on Consumer Theory” will review the literature that is related to Samuelson’s and Lancaster’s work on consumer behavior. Section “Critical Analysis of Samuelson’s (1938) and Lancaster Study” will critically examine Samuelson’s and Lancaster’s work on consumer theory. Section on Logical Analysis of Samuelson (1938) Study will provide a logical analysis of Samuelson’s and Lancaster’s work on consumer theory. Section on Logical Analysis of Lancaster Study will present empirical evidences from studies that have applied Samuelson’s and Lancaster’s consumer theories. Section on Policy Implications will present policy implications, and section on Conclusion will provide conclusions and possible directions for future research in the field of consumer theory. There are many studies that have been published in the field of consumer theory. Studies conducted by Georgescu-Roegen (1936) inspired Samuelson’s studies on consumer theory, while studies conducted by Samuelson (1938), Debreu (1959, 1960), and Morishima (1959) inspired Lancaster’s work. There are very few studies that have directly tested the hypotheses related to consumer theories that are proposed by Samuelson and Lancaster. There are two reasons attributed to this. First, lack of availability of time series data restricts testing the hypotheses proposed by Samuelson and Lancaster (Holländer 2001). Second, Samuelson and Lancaster have proposed the hypotheses related to consumer theory; however, what type of data that is needed to test these hypotheses is still not clear. Third, different studies have used different measures to test the hypotheses proposed by Samuelson and Lancaster. Therefore, comparing research findings across different studies may be biased. To begin with, before Samuelson’s work on consumer theory was published, extant literature on consumer theory was scarce. Two authors who dominated the field of study on consumer theory were Slutsky and Pareto. Slutsky (1915) criticized Pareto’s theory that proposes that utility is independent from all psychological aspects (Pareto 1897; Pareto and Sensini 1906). Slutsky proposed that the pleasure an individual derives from consuming a unit of commodity is entirely a psychological concept. In his paper, Slutsky (1915) derived three important hypotheses. These three hypotheses were as follows: (1) the utility function and its first two derivatives should satisfy the continuity axiom of rational choice (If an individual prefers option A over B, then all choices closer to A should be preferred over B), (2) the characteristics of the utility function do not change with reference to the period concerned, and (3) if an individual’s utility function increases or decreases as he or she switches from one good to another, the mode of this transition does not affect the utility function. Johnson (1913) and Brown (1952) proved that time lags have an impact on the behavior of consumers by using time series data from Canada. Furthermore, Donnea (1972) introduced the concept of time constraint in the study of consumer behavior. According to Donnea (1972), an individual maximizes his or her utility based on two constraints. These two constraints are the budget constraint that relates to the income level of the individual and the second constraint is the time constraint. All decisions that individuals, businesses, and governments make are time bound. Dittmar and Drury conducted a survey of 32 consumers in the UK and found that each consumer is unique in terms of the choices he or she made. In addition to the preferences and low-cost choices, there are other factors that affect the choices made by consumers. These are advertising and pressure from peer groups. Holländer (2001) supported one of the propositions of Lancaster (1966) that emphasizes that utility based on personal preferences is a subjective choice by using data from Germany. He also concluded that measuring utility is a challenging task due to lack of data available on microeconomic measures. Furthermore, Bovi’s (2009) study used data from 10 European countries for 22 years and confirmed that consumer’s utility is a psychological concept. The psychological factors are key factors that distort consumer’s choice and behavior. Bovi debunked Pareto’s theory on consumer choice that utility is independent on psychological factors and judgments. Park et al.’s (2011) exploratory study emphasized that two intrinsic characteristics of e-books make it lucrative for the current e-generation of consumers. These two intrinsic characteristics are ease of access and technology friendly. Albeit this study was not directly on testing Lancaster’s hypotheses about consumer theory, it provides a strong basis for proving the primary basis of Lancaster’s work that emphasizes that the intrinsic properties of goods provide utility to the consumer. Blumkin et al. (2012) argued that taxes on commodities and income tax affect consumers psychologically, and this has a negative impact on their utility. Income taxes have greater impact on consumption as compared to commodity taxes. Valin et al. proved Samuelson’s hypothesis that prices of goods and income are two major constraints in the utility function of households. Valin’s global study showed that demand forecasting models need to account for the prices of goods and income of households. Becchetti et al. (2016) used the Cobb-Douglas production function and developed the theoretical framework that emphasized that some individuals get educated because they want to contribute positively towards the society while others get educated because they want to earn good wages. Different individuals get different intrinsic value from education. Table 1 provides the summary of studies reviewed for this paper. Moreover, a close analysis of the studies reviewed above shows that there are very few studies that have tested the hypotheses proposed by Samuelson (1938) and Lancaster. Studies that have tested the hypotheses proposed by Samuelson (1938) and Lancaster have used different constructs and analysis techniques. This makes it difficult to compare research findings across different studies. According to Frey and Stutzer, incorrect predictions of utility can have an adverse impact on economic welfare. Therefore, due care should be taken while proposing the utility function. Authors should outline the theoretical framework but at the same time try to test it with empirical data for specificity and robustness purposes. In Eq. 1, QD is quantity demanded and P is the price of the product. According to Samuelson (1938), the increasing rate of marginal substitution satisfies the properties of the downward sloping demand curve. Third, Samuelson (1938) criticized that the notion that utility is a very important concept that has been ignored by the field of study on consumer choice. He highlighted in his study that the concept of marginal rate of substitution should incorporate the psychological factors that affect utility. Otherwise, any analysis involving the use of the marginal rate of substitution is ambiguous and abstract that does not capture the real-world phenomenon effectively. There are two criticisms of the conventional consumer theory by Lancaster (1966). First, the intrinsic properties of goods have not been accounted for by the theory of consumer behavior. For instance, if we compare gold with water, we know that water has greater value in use while gold has lesser value in use. However, gold is a scarce resource and water is not scarce; therefore, the exchange value of gold is greater than the exchange value of water. The intrinsic property of goods captures the real-world phenomenon. Organizations also market their products based on the intrinsic value that consumers get from certain products (In marketing terms, this intrinsic value that consumers get by consuming certain products is called unique selling point of their products.). Second, in the recent decade, consumers respond very quickly to new product development and quality issues. The traditional consumer theory does not take into account these issues. The rest of the criticism of the conventional consumer theory and how Lancaster’s theory has addressed the limitations of the conventional consumer theory is provided in Table 2. There are two criticisms of Samuelson’s (1938) work by the author of this paper and existing authors. First, in Eq. 2a,b,c, Samuelson (1938) assumed that an ideal individual will always select the same goods under given conditions. This assumption is abstract and too far from what the real-world phenomenon is. Each individual is unique, and the goods that he or she will select will differ based on his or her tastes, cultural influences, and peer pressure. Second, Samuelson (1938) had proposed three axioms, but how these three axioms will be measured and the techniques that will be used to test these three axioms are not clear. Holländer (2001) also emphasized in his paper that due to lack of data availability and specificity on the measures and techniques, it is difficult to test the propositions of Samuelson (1938). Third, in the current decade, the currency in which the prices of goods are expressed has a lot of impact on the purchasing decisions of consumers. For example, some consumers from developing countries may not purchase goods in US dollars because they believe that it will be expensive, irrespective of whether the good is expensive or not. Fourth, time variable is a constraint on utility maximization that has not been accounted for by Samuelson (1938). According to Donnea (1972), time is one of the important factors that affect consumers’ utility. This has not been accounted for by Samuelson’s (1938) study. Similarly, there are three criticisms of Lancaster’s (1966) work by the author of this paper and existing authors. First criticism is that Lancaster (1966) states that there is one-to-one relationship between goods and economic activity. However, this may not be true as the intrinsic properties of goods can have a number of characteristics and can be related to numerous economic activities at the same time. For instance, there are some consumers who may purchase goods for direct consumption while there may be others who may purchase goods both for direct consumption and also for further processing or value adding. Second, in a complex economy, the relationship between different intrinsic properties of goods may be very difficult to analyze. A combination of goods may have numerous close substitutes and complements. Third, Lancaster (1966) did not discuss about substitution effect that may arise from deceptive advertising of a good. Deceptive advertising may lead to changes in consumer taste in favor of the good that has been advertised in the media. This will lead to substitution effect, but the degree of substitution effect will be lower for advertising as compared to decrease in prices of the good that is advertised. Samuelson (1938) embarked on his study immediately after four restrictive constraints were removed from the study of consumer theory. These four constraints were as follows: (1) marginal utility is a linear function, (2) utilities are independent, (3) utilities can only be measured cardinally (Cardinal utility function emphasizes on ordering utilities based on consumer preferences so that it is measurable like any other mathematical variables), and (4) consumer choice is integrated with preference elements. Unlike the classical economists, such as Adam Smith (1776), who believed in the concept of consumer sovereignty and homo-economicus man, Samuelson did not believe that humans are always rational. He assumed that human beings are not necessarily homo-economicus. They do engage in altruistic behavior quite often. Samuelson proposed three axioms in his paper. In Eq. 2a,b,c, δ represents quantity of n goods purchased, pn shows the prices of these goods, and I denotes income. Samuelson (1938) assumed from Eq. 2a,b,c that an ideal consumer will choose the same goods under any given conditions. Equation 4 clearly shows that goods purchased in batch one are preferred over goods purchased in batch two. In Eq. 5a,b, if batch one is preferred over batch two, consumers cannot prefer batch two over batch one at the same time. In Eq. 6, bkl captures the intrinsic characteristics of the goods and xl is the goods consumed during the economic activity. Lancaster (1966) also assumed that individual ranking of intrinsic properties of goods leads to ordinal utility function (Ordinal utility function specifies that measuring utility is not possible) given by U(z). The relationship between intrinsic characteristics of goods, quantity of goods available to the consumer, and economic activity is indirect. This is in contrast to the assumptions of the traditional consumer theory which assumes that the relationship between these three factors is direct. Furthermore, Lancaster (1966) further emphasized that consumption technology affects consumer behavior. There are few important assumptions made by Lancaster (1966) while analyzing the role of technology in consumption and consumer behavior. The first assumption is that there is one-to-one relationship between goods and the level of economic activity. The second assumption captures three scenarios. These are as follows: (1) number of goods is more than the characteristics of the goods, (2) number of goods is less than the characteristics of the goods, and (3) number of goods is more than the number of characteristics in goods. Given the price of the goods, the consumer will choose the combination of goods that will maximize his or her utility and at the same time has minimized his or her cost. A consumer’s characteristic frontier is convex to point (0,0). Figure 1 captures how the characteristic frontier of four goods with two unique characteristics will look like. A consumer’s composite set of choices can be divided into two parts. The first is the efficiency choice where the consumer will select the efficient combination of goods. This efficient combination of goods consists of those goods that can be attained at minimal cost. The second is the private choice where the consumer may choose goods based entirely on his or her preference. Efficiency choice is subjective, while personal choice is an objective choice. 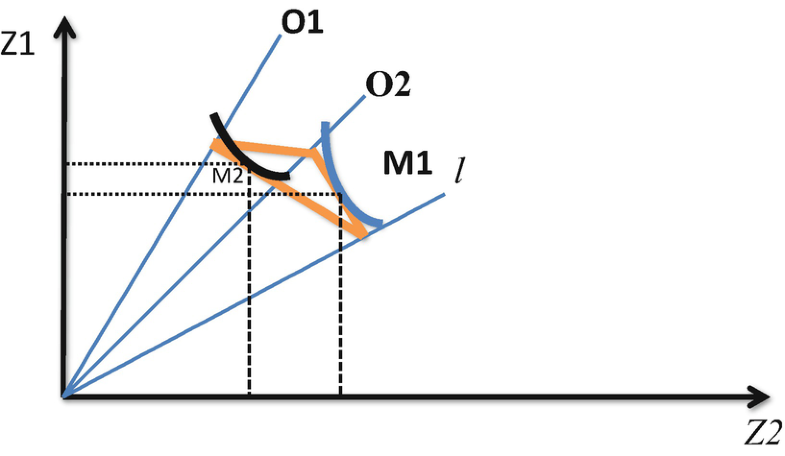 The characteristic frontier expands and contracts based on changes in consumer’s income proposes two relationships between number of goods and economic activity that is parallel to the properties of the Marshallian demand curve. These two relationships are as follows: (1) if the number of goods available in the market is less than the number of economic activity, then not all goods will be attainable by consumers at different prices and (2) if the number of goods available in the market is more than the number of economic activity, then all goods will be attainable by consumers at different prices. Goods that are scarce will be expensive, and all consumers will be able to purchase these goods. On the other hand, goods that are abundant in supply will be cheap and can be easily afforded by consumers. Lancaster (1966) assumed that as a result of the one-to-one relationship between goods and economic activities, there will be a total shift from the consumption of one differentiated product to another differentiated product due to the efficiency substitution effect (Consumers make consumption choices entirely based on the cost of the good. If the cost of the good is high, efficiency substitution effect implies switching to another good that is cheap.). Further, if there are many relationships between goods and economic activities, then efficiency substitution effect will not result in a complete shift in consumption from one good to another. The substitution effect will cause the quantity demanded of the good to fall. Therefore, this good will not completely wiped out of the market. The efficiency substitution effect (Objective means not based on consumer’s opinion.) is objective, whereas the private substitution effect is subjective (Subjective means based entirely on consumer’s opinion and preferences.). It is notable that the efficiency substitution effect is independent of the private substitution effect. In a complex economy, it is expected that both will incur simultaneously and the effect of one will reinforce the effect of the other. In contrast to the characteristics of the modern economy, the simple economy has fewer characteristics and the efficiency substitution effect may not present in the simple economy at all. According to Lancaster, the two important characteristics that will be present in the simple economy will be Griffen’s goods (Goods that may be consumed more as the price of the good rises) and lower price elasticity demand (Change in the price leads to less than proportionate change in quantity demanded.). Two factors that differentiate consumers who are part of the complex economy are consumption technology and income levels of consumers. In Eq. 7, A is the economic activity, A1 is the intrinsic properties of good 1, and A2 is the intrinsic properties of good 2, and then if A1 and A2 share similar intrinsic properties, they will be called intrinsically related, and if they do not share similar intrinsic properties, they are not intrinsically related. If the rise in the price of good A1 will lead to more units of A2 to be purchased, then they are called intrinsic substitutes. If a rise in the price of A1 will reduce the consumption of both A1 and A2, then these two goods can be called intrinsic complements. In a complex economy, there will be more substitutes and complementary goods as compared to a simple economy. Deceptive advertising that does not provide information in a simplified manner leads to substitution effects, and economists do not like this as it causes inefficiency. According to economists, advertising should provide simple and right information to consumers. In addition to the above arguments, suppose an individual chooses occupation one O1 over occupation two O2; this implies that this individual prefers more leisure as compared to work. Therefore, this individual will be on the indifference curve M1. Alternatively, if an individual prefers more work over leisure, then this individual will be on the indifference curve M2 (see Fig. 2). In Fig. 2, l shows the leisure, Z1 is economic activity one, and Z2 is economic activity two. The individual who chooses occupation two is better off than an individual who chooses occupation one because he or she will be earning more money by working and enjoying less leisure. In summary, Lancaster’s consumer theory can be summarized in Fig. 3. 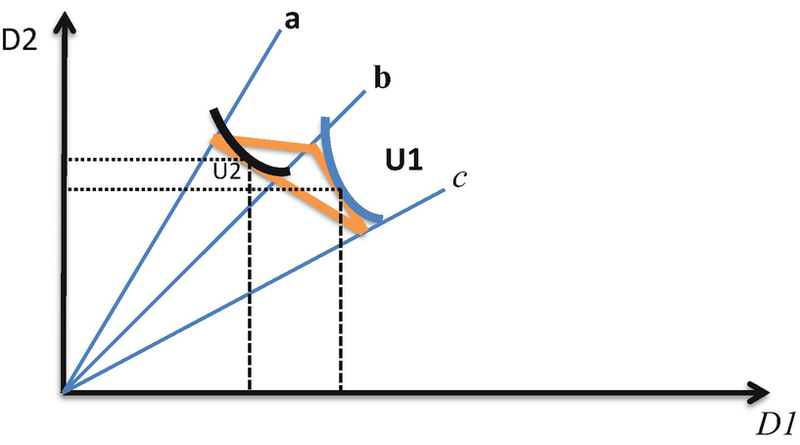 Figure 3 shows the combination of intrinsic properties of the goods that can be purchased from the combination of goods a, b, and c. Some individuals will purchase goods at U1 in order to maximize economic activity D1, while others may purchase at U2 to maximize economic activity D2. Furthermore, the studies conducted by Samuelson and Lancaster (1966) have implications for policy makers. There are two policy implications of this study. First, policy makers can use the propositions of Samuelson’s study to design policies in order to prohibit the consumption of certain products, such as drugs, marijuana, and tobacco. According to Samuelson and Lancaster (1966), it is the goods and the intrinsic properties of these goods that provide utility to consumers. If they want to change the taste of consumers, they can use simple advertising and disclose the negative repercussions of these products in order to reduce the consumption of these commodities. Second, policy makers can also promote the consumption of commodities that may provide similar intrinsic properties as unhealthy products so that consumers can easily substitute unhealthy products with healthy ones. For example, increasing taxes on the consumption of unhealthy soft drinks will reduce the consumption of soft drinks and increase the consumption of healthy drinks. The main aim of this paper was to review Samuelson’s and Lancaster’s work on consumer theory. The review of this study shows that Samuelson’s and Lancaster’s work complement each other. Lancaster has expanded the work of Samuelson by arguing that the good itself does not provide utility but it is the intrinsic properties of the goods that provide utility. Studies that have applied the propositions of Samuelson and Lancaster have supported their argument that utility is a psychological concept. Future researchers should conduct studies that try to integrate more aspects of a real-world phenomenon in the utility function. First, the linear utility function of Lancaster is very complex and needs to be expressed by using budget constraint line and indifference curve. Testing this theory by using real-world data is close to impossible. Second, in the Lancaster’s paper, future researchers should also look at how the unfavorable intrinsic properties of the goods can affect consumer’s choice.